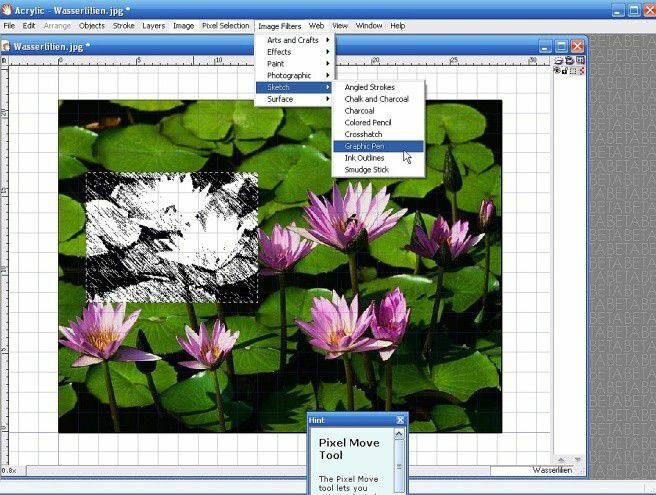 Microsoft on Monday posted the second CTP (Community Technology Preview) of its Acrylic design tool, adding support for XAML (Extensible Application Markup Language) to benefit users of the planned Windows Vista OS. Microsoft is positioning Acrylic as a graphic design tool that can both compete with and complement offerings from companies such as Adobe Systems, Macromedia, and Corel. "Acrylic is particularly good at graphics that have a very artistic visual treatment, making images that look like they were drawn with paint or acrylic or chalk," said Forest Key, group product manager in the Microsoft developer tools division. For example, an Acrylic file featuring organic chalk or water color illustrations could be used with a high-end printing product such as Adobe InDesign, Key said. Products such as Macromedia Fireworks, meanwhile, have some overlap with Acrylic. XAML will be of particular benefit for developers working with the Windows Presentation Foundation technology, formerly called "Avalon" and planned for the upcoming Windows Vista platform, Key said. Vista had been codenamed "Longhorn." "What [XAML] will allow is designers using Acrylic to mock up visuals for how they want an application to look," Key said, with a developer subsequently able to deploy the XAML code in Windows Presentation Foundation. An "alpha transparency" function will enable developers using PowerPoint to describe the edge of an object without resorting to rectangular white borders, according to Key. The CTP also features hundreds of new brushes, textures, and gradients for colors, Key said. "I think [Acrylic is] going to give the Adobe products a run for their money," said Kerry Bodine, senior analyst at Forrester Research. "It's just got a lot of new features that we haven't seen before in [Adobe's] Photoshop or Illustrator." Acrylic's ability to combine pixel- and vector-based images gives it an edge in flexibility, Bodine said. "Acrylic combines both of these in the same tool." A CTP enables users at large to try out a specific technology. The initial CTP in June was downloaded 200,000 times, according to Microsoft, which has not yet announced final release dates for Acrylic. Acrylic is based on the Creature House Expression technology, which Microsoft acquired in 2003. It can import the following formats: .tif, .psd, .jpg, .bmp, .png, .gif files. The technology can export these formats: tif, .psd, .jpg, .bmp, .png, .gif, .ai, .eps, .pdf, .xaml. There also is support for copying and pasting to Microsoft Office and exporting to HTML. Also in the area of Microsoft development tools, Microsoft has released an August CTP for its Visual Studio 2005 platform that features a new implementation of the System.Nullable data type. A nullable type is a structure that combines a value of the underlying type with a Boolean null indicator, according to Microsoft. The nullable type previously used only worked well in strongly typed scenarios, according to a Microsoft blog.